The Ardennes (Ardennais) is is a heavy horse belonging to both France and Belgium. It is a direct descendant of the pre-historic horses whose remains were found at Solutre; primitive features such as the skeletal formation of the head, with its distinctive, squared-off nose, are still evident in the modern breed. The Ardennais was known to both Julius Caesar and the Greek historian Herodotus, who praised them for their hardiness and stamina. Originally small, broad-bodied draught horses, the Ardennais undoubtedly formed the basis for the great horses of the Middle Ages. THE OLD TYPE During the 17th, 18th, and 19th centuries, the Ardennais horses were stocky, lively animals that were both ridden and used as excellent light draught horses. During the French Revolution (1789), and in the following years of the Empire, they became renowned as the best artillery horses in Europe. Large numbers pulled the French guns and transported food supplies during Napoleon’s disastrous Russian campaign in 1812, and it was said that they were the only horses hardy enough to withstand the rigors of the winter retreat from Moscow and bring home a substantial part of the Emperor’s wagon train. Some of those hardy, lighter Ardennes post-horses were still to be found in north-east France, in Bassigny and on both sides of the upper Marne, around Chaumont, until the 1970s. Otherwise, there is little evidence o this old, lighter type remaining today. MODERN ARDENNAIS At the beginning of the 19th century the Ardennais was crossed with Arab blood to increase its energy and activity. 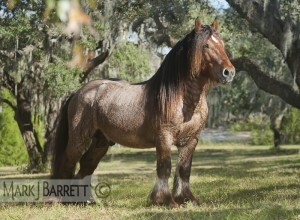 Later, some Percheron, Boulonnais, and Thoroughbred crosses were introduced. However, the impact of these last three was transitory, except possibly in the related Auxois. The trend towards a bigger, heavier animal was brought about in the 19th century by the changing demands of agriculture and the need for an increasingly powerful horse for very heavy draught work. Three distinct types of Ardennais evolved over the years: a smaller sort, nearest to the old type, which stands between 1.52 and 1.63 m (15-16 hh); the bigger and more massive Ardennais du Nord, also known as the Trait du Nord, which resulted from outcrosses to the Belgian Draught Horse and the powerful Auxois. The popular Ardennais du Nord comes largely from Lorraine. Known as “the cart-horse of the north”, it has a massive bone structure and correspondingly strong muscles. The powerful Auxois from Burgundy is similar to the Ardennais du Nord, but was more influenced by the 19th-century Percheron and Boulonnais crosses. Thousands of Ardennais were used in the First World War, when the active, traditional horse again found favor for hauling stores, guns, and ammunition. Losses during both World Wars led to the importation of Dutch and Belgian stallions, but it is now no longer necessary to bring in foreign blood and such outcrosses are much less frequent. Today, the Ardennais is raised for the meat market as well as for use as a heavy draught horse. CHARACTERISTICS The modern Ardennais is more thick-set than any other draught horse and has been described as being built like a tractor. It has a wide frame and a rather short back with very muscular loins. The legs are quite lightly feathered, and the feet, in comparison with the massive body, are smaller than might be expected, although they are well-made, strong, and seldom flat or brittle. The Ardennais has small, pricked ears, which is unusual in heavy breeds. Because of the exceptionally good shoulders, the action of the smaller type of Ardennais is free, animated, and straight.